New Posh signing Joe Gormley (right) with first-team manager Dave Robertson. Photo: Joe Dent/theposh.com. New Peterborough United signing Joe Gormley is convinced he can transfer his prolific goal-scoring record across the Irish sea. 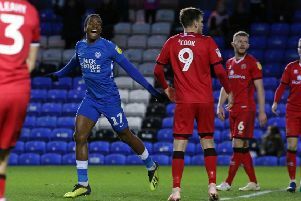 The 25 year-old striker became the second Posh signing of the summer, after former West Ham midfielder Jack Collison, yesterday (June 14) when moving for an undisclosed fee from Irish Premiership side Cliftonville. Gormley’s scoring record in Irish football is very impressive. He claimed 111 goals in 170 appearances for Cliftonville, including a club record 41 last season. “I’ve always dreamed of playing across the water,” Gormley admitted. “And now I’m determined to take my chance and prove that I can be successful in the Football League. “It was a tough decision to leave Cliftonville as I grew up around the corner from the club and I’ve had some great years there. “But I’m confident I will carry on scoring over here. The nets are the same size after all. “Players have come over from Ireland before and done well. My strike partner from two seasons ago Liam Boyce moved to Ross County and is tearing it up there so hopefully I can do the same. “Some people said I would struggle to score so many goals for Cliftonville without Liam, but I ended up scoring even more. McCann played against Gormley during his own brief spell in Irish football at the beginning of the year and Posh manager Dave Robertson insisted it wasn’t just the number of goals his new man has scored that made him a priority target. Robertson said: “I have no doubt that Joe will score goals for us, but he also has great variety in his game. He is a fox in the box, but he’s also a seriously hard worker with great energy. “He will press from the front and work hard for the team. I am convinced he will be an asset in our push for promotion and if we are successful in that aim he will be an asset in the Championship as well. Posh will play Cliftonville away in a friendly on Wednesday, July 15 as part of their pre-season Irish tour which starts on July 13.